Tony Diodato of Cypress Computer Systems, center, reviews robot-building strategies with a small group of students from his new Strike Zone robotics team, along with students from Lapeer robotics Team 1684, the Chimeras. LAPEER, Michigan – To kick off the 2014-2015 robotics season, a new local robotics team has emerged. Known as Strike Zone, it’s the Lapeer area’s seventh high-school robotics team. Strike Zone Team 5460 is headed up by engineer-programmer Tony Diodato of Cypress Computer Systems. 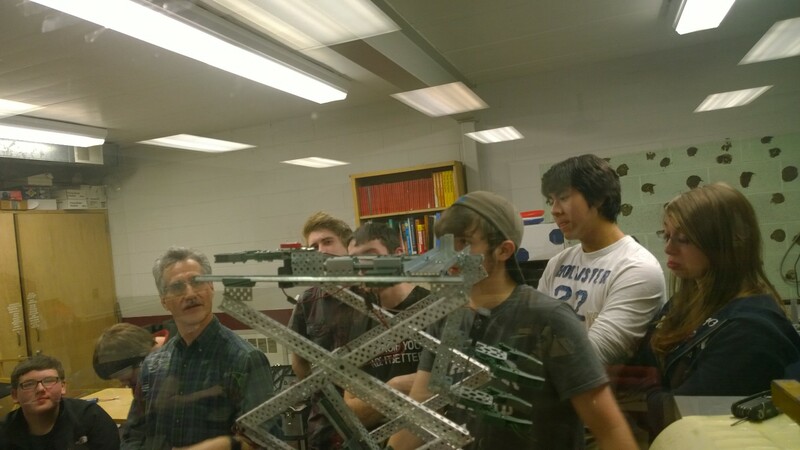 Diodato, who coordinates the robotics programs based at Lapeer’s Center for Innovation, said creating a new team has enabled an influx of freshmen ─ along with a few former Chimeras from Team 1684 ─ to get more involved in building a robot than would have otherwise been possible. Jon Uren, an original member of the Chimeras team, continues to coach the Chimeras. Robot-building strategy will be completely separate for each team, although the teams plan to work together on off-season projects, such as the Downhill Derby which happens during Lapeer Days each summer, and the ROBO-CON robotics summer festival first launched by the Chimeras in July. For now, the two teams are sharing the same space, the former machine shop at Lapeer’s new Center for Innovation. The availability of state funding for rookie teams made this year an ideal time to start a new team, said Diodato, who has been considering creating a new team for some time. The seven area high school teams are part of the international FIRST organization (For Inspiration and Recognition of Science and Technology), at the FIRST Robotics Competition (FRC) level. Along with Strike Zone and the Chimeras teams, the Lapeer area FRC robotics roster includes Lapeer’s Ed Tech Team 3535, the Galak Tech Invaders; Team 4961 of Almont, Shock and Awe-sum; Team 5048 of Imlay City High School, the Spartronics; Team 5201 of North Branch, the Broncos; and Team 5238 of LakeVille, the Falcons. The Chimeras and Strike Zone teams are two of five robotics teams now based at Lapeer’s Center for Innovation at the school’s West campus. The Center also serves as home base for two FTC (FIRST Tech Challenge) middle school teams and a new FIRST Lego League (FLL) elementary-age team. The FIRST Robotics Competition combines the excitement of a varsity sport with hands-on training in science and technology to help high school students discover how rewarding a career in engineering or technology can be. Every student on a FIRST robotics team has a chance to turn pro. Currently Lapeer robotics team 1684, the Chimeras, is seeking community sponsors to fund the upcoming season, which begins Jan. 3, 2015. The cost for each high school robotics team to build and compete a robot ranges from $15,000 – $40,000 a season. Community contributions of any amount are welcome; teams also welcome in-kind donations and help from mentors with experience in science, technology, engineering, programming, electrical, machining, education and other related areas. Chimeras robotics students work year-round to develop skills in science, technology, engineering and math, then use those skills to mentor others and contribute to the Lapeer community through events such as the annual Lapeer Days free Downhill Derby, and the new “accidentally educational” Robo-Con event, a free annual community festival introduced by the Chimeras in July. Want to help the work of the Chimeras robotics team? Contact Tony Diodato at tony@first1684.com. What a great program. Thank you Tony Diadato for supporting this important program for our schools. Thanks for running this! As a parent, I’m so grateful that my student has this opportunity. Only regret is that we didn’t get involved sooner. And I second what James said, thank you to Tony Diodato and to Jon Uren for the MANY, MANY unpaid hours they dedicate to the teams, and to Tony’s wife and Jon’s fiancee for understanding the importance of this investment they’re making in our community. They are both amazing people.